I have an almost-13-year-old daughter. Her growing up is one of the scariest things in the world for me. I see how kids treat each other. Girls, especially, can be brutal. My daughter has always had the confidence to stand up in front of her class and give a presentation. She has no problem performing on stage. My brave little one tries out for any sport she decides she wants to try. She even played on a boys’ football team for a while – that’s some guts right there! But, I’d be lying if I said I wasn’t scared as hell for the future. As she approaches her teen years, I worry about how everything could change. That amazing self-esteem she has always had – will it always be there, or will others crush it? As her mom, I want all the tools in my toolkit to help me continue to instill a sense of empowerment in her. I want her to know why the things she does are important to herself, to me, and to the world. It’s important for me to encourage her to be herself while never getting scared to try something new for fear of not being good enough. As my daughter grows from a little girl into a young woman, I want her to learn to navigate the world in a positive way. Sure, there will be tons of negative things to move past along the way. But, I’ll be there for every step, every leap, and every fall. That’s how I empower her to be her best self. I said I wanted every tool in my toolkit, right? If you’re the mama of a young daughter, you should, too. I recently learned about a coloring book by best-selling artist, Jess Volinski, called Amazing Me!. At first glance, it may look just like one of the thousands of coloring books marketed to girls older than preschool-age. This coloring book is more than a coloring book. It’s a book of empowerment, boasting messages like, “You have a great smile!” and pages that encourage girls to fill in the blanks about what makes them so amazing. The concept is brilliant and it’s something I’d want my own daughter to use. Creativity is an awesome outlet for expression. And young girls need creativity combined with empowerment. Because this is a topic that I’m passionate about, I asked some Jess some questions to get to the nitty-gritty of this book. Jess Volinski is a graduate of the School of Visual Arts in New York City and the author/illustrator of over 18 best-selling coloring books including the popular Notebook Doodles® series. Jess got her start in publishing as a freelance designer in the children’s book departments of Scholastic, Henry Holt, and HarperCollins. In addition to creating books, she also licenses her art for products. Originally from Connecticut, Jess now lives in southern New Jersey with her husband Erik, who is also an illustrator, and their two kids. Amy: What is the story and mission behind Amazing Me!? Jess: I designed all my books specifically to inspire creativity and help build self-confidence. It’s my hope these books inspire young people to dream big and use their unique creativity to express themselves and be empowered to make their own amazing things to share with the world (and- most importantly- feel great about themselves in the process!). Courtesy: Jess Volinski. Some of the amazing pages from Amazing Me! I leave room in each book for you to add your own creativity to the designs, beyond just coloring them in. Some have journal-style prompts, questions to answer, lists to fill in, or drawings to complete so you create pages that reflect who you are and make the book your own. I see all my books as a collaboration. I might finish my book and send it off to my publisher but that book is not truly complete until someone picks it up, brings it home, colors it in, and makes it their own. And this is especially true of Amazing Me!. Besides having lots of fun doodles to color, almost every page in the book has lists to fill in about your favorite things, prompts to answer about yourself and your family, and frames to paste in photos. It’s a book designed to make you feel proud of yourself and all the amazing people, places, and things in your life that make you, you! Hopefully once you’re finished adding yourself to each page you will have a beautiful, treasured book that will always remind you how amazing and unique you truly are. What does empowerment mean for young girls and why is it so important? Why are young girls such a vulnerable group? Empowerment means having the confidence to believe in your abilities and ideas and taking action to bring your ideas to life. When we’re empowered we are capable and strong; we try new things and reach for success. The first step towards success is believing you can succeed– and that belief comes from your confidence. But confidence isn’t just a switch you can flick on in yourself; for most people becoming confident is a journey. It’s a part of yourself that you patiently build- and building anything takes hard work, time, and effort. Courtesy: Jess Volinski. Jess in action, proving that girls and women can seriously do anything. All young people- not just girls- are vulnerable simply because they haven’t had much time yet in life to build their confidence. I’ve noticed a lot of people- of all ages- tend turn to social media to feel good about themselves, but that’s not a great way to build lasting, healthy confidence. Social media can give you a quick boost, but it’s fleeting. The empowering kind of confidence comes from within; it’s your realization of your abilities. Building it up is a journey of self-exploration, just like a creative process where you have an idea and work to bring it to life. You create your confident self. How can a healthy confidence help girls find success in life? When we’re confident, we believe in our abilities, our ideas, and our values. Confidence allows us to think for ourselves and ignore those who try to hurt us or bring us down. Confidence also means being able to separate ourselves from the outcome of our endeavors- just because something we try to do fails, it does not make us a failure. That’s such an important concept for young people to learn and the only way to understand it is through experiencing the process of trying lots of things and failing at some of them. Ultimately, increasing your confidence encourages you to take more risks, which allows you to learn how to better deal with failure, which then leads to having the increased confidence to take on new challenges. This cycle of resilience is the foundation for success in life. Healthy, well-built confidence is like an internal fortress; it shields you wherever you go against whatever life throws at you. When you know what you are capable of you’re more likely to stand up for yourself, make things happen, express yourself, take control of your choices, be assertive, and work hard to achieve all you want in life. What are some examples of good risks that young girls can take in life to build their confidence? Oh, what a great question! I’m a big believer in taking calculated risks; it’s a huge part of not only making art but also running your own business and creating your own life. A great kind of risk young people can take is to try new activities- learn an instrument, write a story, join a club, or get involved in a community program in your town. Do something that pushes you outside of your comfort zone. Will you love everything you try? Of course not! But finding those things that we really love to do, that ignite our passion- those experiences reveal our abilities to us and help grow our confidence. But you’ll never know what you really love to do unless you try lots of things. Discovering your abilities takes effort and you risk failing- which is scary! One of my fave quotes is from the artist Georgia O’Keeffe. She said, “I’ve been absolutely terrified every moment of my life – and I’ve never let it keep me from doing a single thing I wanted to do.” What a great reminder that everyone has fear, everyone has moments of doubt. But, you cannot let those feelings shake your belief in yourself and your abilities. You’ll be so proud of yourself when you push past that fear and discover what you’re capable of. How can creativity inspire confidence and empowerment in young girls? I think it’s so important to encourage creativity- especially in young people- because expressing yourself is such a powerful confidence builder. The feeling you get when you realize you can take anything you imagine in your mind and make it real, and then share that creation with other people, is incredibly empowering. Plus, it just feels great to make something! You can look at your creation and know your hard work brought it to life. Courtesy: Jess Volinski. Jess’s studio, where creativity happens. But let me back up a moment and define what creativity is- and isn’t. 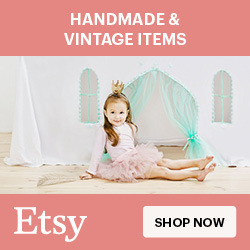 It can, of course, be a traditional art or craft project but it can also be many other activities like making up a story with a friend or sibling, playing outside, turning a box into a spaceship, building a sandcastle, or simply making a pillow fort. Any activity where you have an idea and then plan how to make it happen and work to accomplish that plan is an example of creativity. It’s really important to understand that creativity isn’t just about drawing and painting. I’ve talked to so many people who shut the door on their own creativity by saying, “Oh, I’m not creative at all! I cannot even draw a stick figure.” While artistic talent might be part of some people’s creativity, art skills do not define creativity! Let me say that again because it’s really important: You do not need to know how to draw or paint to be a creative person. Creativity is a thought process and a way of solving problems. No matter what you do in life- whether you’re an artist or teacher or business owner or dentist- exercising your creativity will help you do even better work. Creativity is about translating our ideas into action- and ultimately about realizing you have the ability to make your life what you want it to be. How might moms help their young daughters build self-confidence and empower them to be their best self? There are so many ways that we as parents can help build our children’s confidence. I have two kids- an 11-year-old son and 9-year-old daughter- so I think about this a lot. One of the best ways to help our kids’ confidence grow is to make sure they know they have supportive people in their life who are there to listen and guide them. Encourage, encourage, encourage! I cannot emphasize this enough. Our words as parents have some much power. Encourage kids to make things. Encourage kids to push past their fear and hesitation and try new activities. You can encourage and praise them when they have done something that has demonstrated their values. Encourage them to express themselves so others hear them. Help them step outside their comfort zone. Since social media isn’t a great way to build lasting confidence, it’s important to talk with your kids about healthy limits for screen time on devices and why you’re limiting their screen time. Technology is an amazing tool with many healthy digital resources. But, it can be a major distraction, too. Making sure your kids have a balance of constructive screen-time and unplugged hands-on creative time is key to encouraging their abilities and confidence. Some kids might have trouble mustering that initial confidence to get started on something creative. Maybe they just don’t know what they want to do and your encouragement alone just isn’t doing the trick. In this case, doing a creative project together with your child might be just what they need to get them started. Coloring together is a really wonderful (and easy!) option. Find a coloring book that interests each of you. Sit down with a pack of gel pens and just start coloring. It’s a great way to relax and chat together and build up that creative confidence. Let’s Start Empowering Our Girls! Let me know what you think of Amazing Me! by Jess Volinski! What do you think about the idea and what she has to say? How do you help encourage and empower your children? Connect with me on Twitter, LinkedIn, Facebook, or Instagram and keep the conversation rolling!